DNA, RNA and Protein Synthesis - Welcome to The Frog Pad! DNA stands for deoxyribonucleic acid. In eukaryotic cells, you will find DNA in the nucleus. ­DNA is o­ne of the nucleic acids, information-containing molecules in the cell (ribonucleic acid, or RNA, is the other nucleic acid). DNA is a record of instructions telling the cell what it's job is going to be. A good analogy for DNA as a whole is a set of blueprints for the cell, or computer code telling a PC what to do. When a cell is in its normal state, the DNA is not duplicating and it just looks like a blob of white strands. Scientists use the word chromatin to describe that DNA. When it is time for the cell to reproduce, they condense and wrap up very tightly. The tightly wound DNA is called a chromosome. Although it may look complicated, the DNA is really just a macromolecule made up of four different parts called nucleotides. The nucleotide in DNA consists of a sugar (deoxyribose), a phosphate group, and one of four nitrogen bases (cytosine (C), thymine (T), adenine (A), guanine (G)). 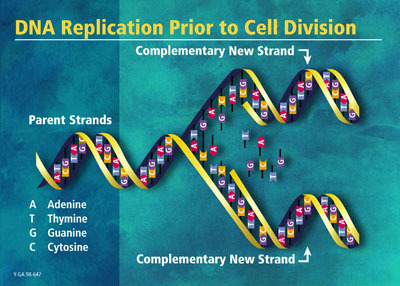 The nitrogen bases point inward making up the "rungs" of DNA's twisted ladder. They follow a base pair rule: A with T and C with G.